6x4-inch Gun Prohibition Decal or on .080 aluminum plate. (Engineer Grade Prismatic). 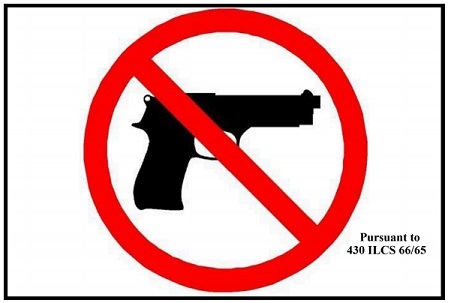 Under Illinois Gun Concealed-Carry Law, sign should be posted in clear and conspicuous location at the entrance of buildings, premises or property where carrying of firearms is prohibited. Available as decal (for window or door) or on .080 gauge aluminum plate.